Heiko Blankensteins work is based on systems of chaos theory research. These have in common the sensitive dependence on the initial conditions of an event. The slightest changes during the development of one of these systems lead to significant alterations of the end result. As an example of this, the Lorenz attractor states that the flap of a butterfly's wing in the Amazon rainforest can trigger a storm in Europe. 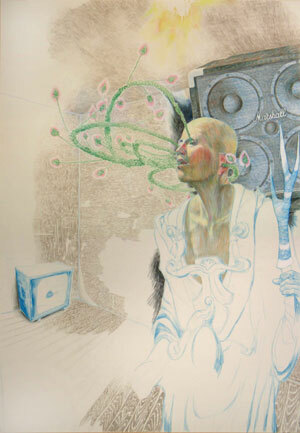 Central to his second solo exhibit at Alexandra Saheb are large scale drawings, executed in color pencil, pencil and ink. The unforeseeable expansion of a core object and its vast effect are the key elements in his work. Simultaneously he ponders the appearance of the large within the small. Similar to an almost infinite zoom lens, one repeatedly can find the same forms appear in the drawings, just as in nature itself. Scenarios develop, which are not rooted in authentic reproduction of natural circumstances, but rather in their physical laws. The minutely drawn, complex, but nevertheless done without any preliminary sketches works on paper take shape by means of slight alterations of direction from one line to the next. This results in an accumulation of sometimes circumstantial structures, which slowly progress into final shapes: Trees, architecture and characters. Hereby Heiko Blankenstein creates very individual, surreal imagery. Nature and urbanity fuse into a newly generated unit without dissolving each other.